Tony's Talking Pictures Blog: Tony's Movie Reviews for Friday April 21, 2017 "The Promise" and "Unforgettable"
Tony's Movie Reviews for Friday April 21, 2017 "The Promise" and "Unforgettable"
In the film a woman sets out to make life a living hell for her ex-husband's new wife. “Unforgettable” suffers from the problem that it thinks its smarter than it is. In truth, we have seen this type of film many, many times before with movies like “Obsessed,” “The Crush,” “The Babysitter,” Fatal Attraction,” and “Sleeping with the Enemy” to name a few. “Unforgettable” never reaches for anything new and despite watchable performances by both Katherine Heigl and Rosario Dawson, the film can't muster any interest on the audience's part. In the end, “Unforgettable” is mostly forgettable. Check out "Fatal Attraction" and other suspense films at NetflixDVD and get your first month FREE! “The Promise” is set against the backdrop of the last days of the Ottoman Empire as war ensues. The story focuses on an American Journalist, a beautiful socialite and a medical student who become entangled in a love triangle. 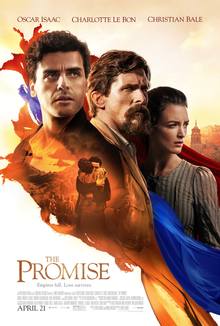 Despite the fear you may have in seeing romantic war-time story, “The Promise” actually delivers an engrossing story. Oscar Isaac and Christian Bale deliver powerful performances as rivals who must come together for the greater good. “The Promise” is a well-crafted sentimental story with terrific pacing and heart.